American Scientist reported the research on Forest Medicine conducted in Japan. 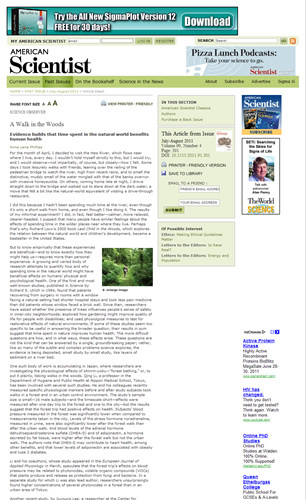 Recently, the American Scientist (July-August 2011 Volume 99, Number4)reported the research on Forest Medicine conducted in Japan. Lee J, Park BJ, Tsunetsugu Y, Ohira T, Kagawa T, Miyazaki Y. Effect of forest bathing on physiological and psychological responses in young Japanese male subjects. <http://www.ncbi.nlm.nih.gov/pubmed/21288543> Public Health. 2011 Feb;125(2):93-100. Tsunetsugu Y, Park BJ, Miyazaki Y. Trends in research related to "Shinrin-yoku" (taking in the forest atmosphere or forest bathing) in Japan.<http://www.ncbi.nlm.nih.gov/pubmed/19585091> Environ Health Prev Med. 2010 Jan;15(1):27-37.